While bicyclists also own automobiles, some do not, choosing to instead use their bicycles as their means of transportation. Those who do own insured cars may not be aware that their policies also provide some protection to them if they are injured in a bicycle accident while commuting. Cyclists who do not own cars and who are not named as allowed drivers on another person’s insurance may still be able to purchase insurance coverage for their bicycles. The availability of separate bicycle accident insurance policies is a new development. Previously, cyclists were unable to purchase this type of coverage, but it is now available through at least one company. Traditional insurance companies avoided offering separate policies for bicycle accidents for many years. They tended not to do so because of the difficulty in quantifying the costs associated with the risks as well as to determine the number of potential customers who would be interested in such insurance. In response to this, two cyclists partnered with Markel American Insurance in order to provide standalone policies for bicycle accidents. This new company, called Velosurance, offers a variety of different coverage options includes medical payments coverage. Through the company, cyclists who opt for this coverage and who are injured in bicycle accidents can receive payments for their medical expenses up to the limits of their bicycle accident insurance policy. If you do own a vehicle, then your coverage MAY extend to your bicycle. One way that people are able to maximize the amount of their available coverage is by combining policies. This means insuring both your vehicle and your home and adding a personal injury liability umbrella policy containing both underinsured motorist coverage and uninsured motorist coverage. Doing so can greatly increase the available coverage amount, increasing it up to $1 million or more. Cyclists who ride their bicycles a substantial number of miles each year are statistically likely to be injured in a bicycle accident around once every seven years. Unfortunately, there are many people who simply do not have insurance coverage on their vehicles and others who have insufficient coverage to pay for the types of personal injuries people can suffer in bicycle accidents. 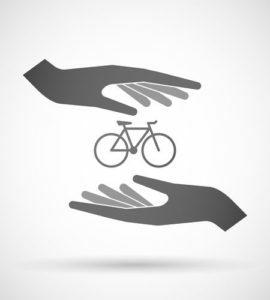 If you have a bicycle accident insurance policy of your own, then you have the ability to recover money for your personal injuries directly from your own policy. In urban areas of southern California, such as Los Angeles, people who use their bicycles to commute to and from work should definitely consider purchasing bicycle accident policies. With so many vehicles crowding the highways and streets in cities, the likelihood of being involved in a bicycle accident increases. Bicycle accident injuries may also be very severe because cyclists do not have the steel frame that other vehicles do to protect them. This means that if a motorist collides with your bicycle, your resulting medical bills are much likelier to be substantial. Having a bicycle accident insurance policy in place can give you the peace of mind that your accident-related injuries will be covered even if you are hit by a person who is uninsured. Bicycle accident insurance can also help you with replacing your bicycle in the event that it is damaged beyond repair. If you have been injured in a bicycle accident, you may need to get the help of a personal injury attorney in order to recover damages to compensate you for your losses. When the vehicle’s driver is at fault, his or her insurance company is still likely to try to dispute the liability. An attorney may help you to prove fault. If the other motorist does not have sufficient coverage, a lawyer may also be able to help you recover the maximum amount from your own bicycle insurance policy. To learn more about the potential damages that might be available in your case, contact a Los Angeles bicycle accident attorney today.